I'm looking at a very similar set-up to you by the sound of it. It's really great to see how the tyre and wheel looks and how you're going with fitting it up. 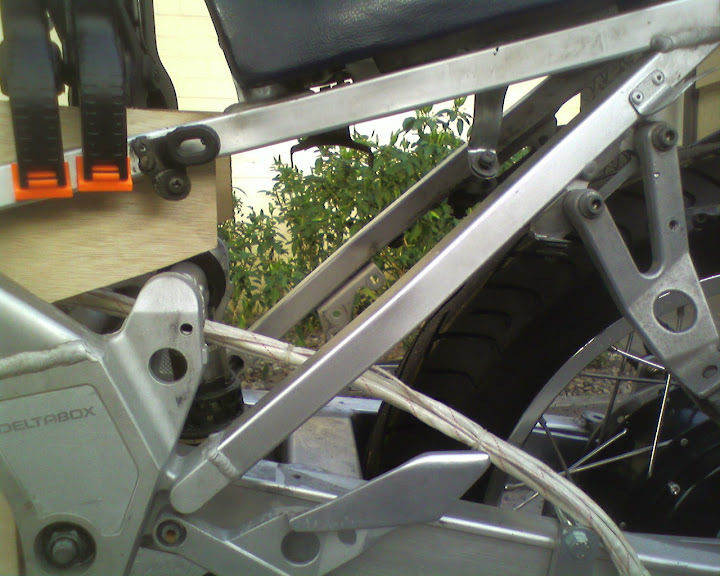 I'd watch out with using clamps to hold the torque arm to the swing arm. With the amount of torque the motor can generate, I'd imagine it will be able to start slamming that arm against those bolts only a couple of runs after you've fitted it. 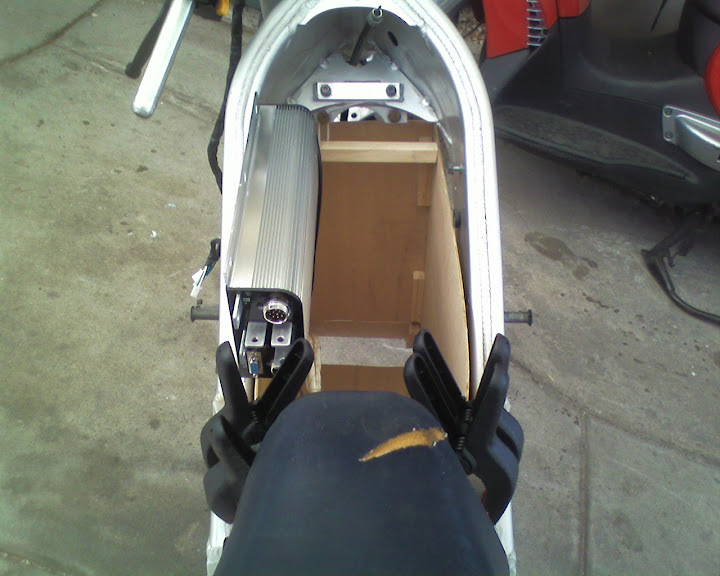 Would it be a better idea to bolt the torque arm directly to the swing arm by a hole (or holes) drilled through both? One of the guys here at the Canberra EV group suggested getting in contact with the person who does the mechanical checks and roadworthy inspections and check things with them throughout the process. That way you don't get any nasty surprises that force you to go back to the drawing board, and they may give you some tips about how to solve mechanical problems like attaching the torque arm. I look forward to see how you fit that many 100ah batteries in your frame! You have the advantage of a hub motor, but hopefully I could use a similar method for my 22 cells. I'm partway through making cardboard mockups of the cells at the moment, so I ought to have some idea of the volume needed. Wondering if you have picked a charger? Looking around at the options myself so thats why im interested. this thread was reposted to elmoto.net by Mark, the owner of Enertrac. I'm doing a build of an 85 Honda VF500F Interceptor with an enertrac MH602 and 36 Thundersky 60Ah batts too. I went with a KBL12401I (120V/400A) controller. 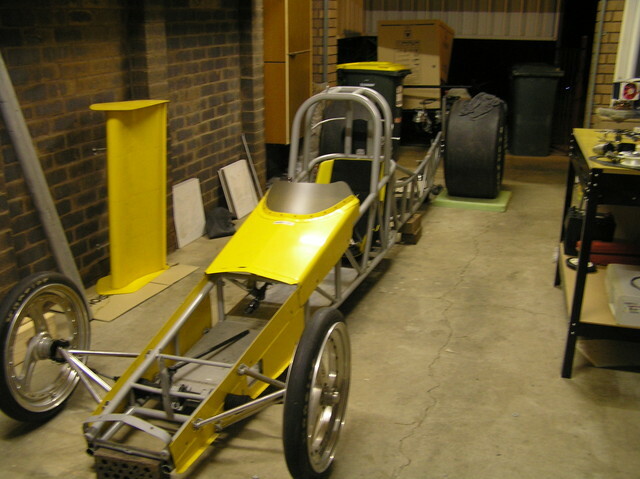 My original desire was to be able to get about about 60 miles (~100km) with a top speed of around 75mph (120kph). Seems similar to what you're looking for. Great minds think alike! i have to say, it's difficult to fit that many batteries in any frame, but hopefully you'll be able to get them in there. it may be easier for you if you since you don't have a cradle to deal with. Anyway, good luck! I'm interested to hear how things go for you. I'm also interested in your Wh/mi (or km) calculations. 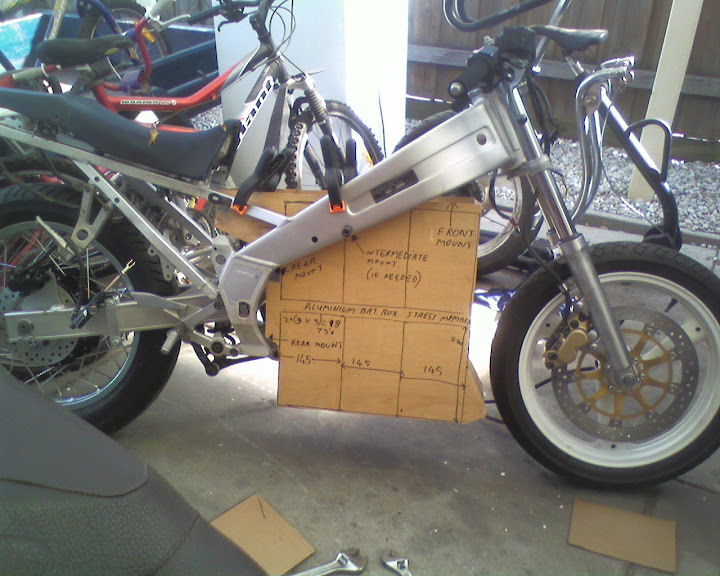 Info for my build is on my blog at http://electriceptor.wordpress.com or at http://www.elmoto.net/showthread.php?t=1452. It's super slow going these days since i don't have much time to work on it. BTW, for you moto guys who don't already know about it, elmoto.net is a great forum for electric motorcycles. The people there are very knowledgeable and super friendly. I don't want to drill holes in the swing arms as this will weaken them. I think the clamps will be OK just need some work, thats all. 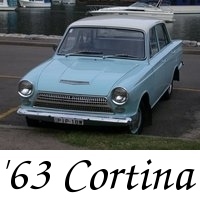 PaulWay wrote: One of the guys here at the Canberra EV group suggested getting in contact with the person who does the mechanical checks and roadworthy inspections and check things with them throughout the process. I am speaking with a VASS engineer now. Just waiting till I have the cash and I will get answers on the weight issue and then he will come around and have a look and advise on what to do (before I start anything major). Last edited by GRMarks on Thu, 25 Mar 2010, 17:14, edited 1 time in total. TimothyForde wrote: Wondering if you have picked a charger? Looking around at the options myself so thats why im interested. No haven't thourgh about it yet. The battery purchase is a long way off at this stage. Once I know for sure what battery size I can fit (and legaly use) I will start to consider the charger (may be 2 ?). __Tango wrote: I'm also interested in your Wh/mi (or km) calculations. Mark gets about 130 watts/mile at 60 - 65 MPH. He thinks about 150 watts/mile at 80 MPH. But with an airodynamic fairing this can be reduced (alot according to others). I plan on working hard at the airodynamics. Would love to get 115 watts/mile at 70 MPH. It may not be possible but I am going to try ! antiscab wrote: one word of caution, kelly are a bit optimistic when it comes to controller ratings. are you talking about brushed comtrollers or BLDC controllers ? I have heard good reports on the BLDC controllers - contry to yours ??? Well I have lashed out and bought (ordered) a KBL12401I controller (120 volt brushless DC with 400 amp peak, 200 amp continus and regen). I have also ordered a electric throtle and a small DC to DC converter to drive the Kelly controller. Also today I picked up the bushes and seals for the right hand fork leg. Still to buy on the shopping list is a DC to DC converter (for the lights blikers etc. ), a contactor, enginee fees (big ticket item) batteries and battery management system (last big ticket item, the biggest! 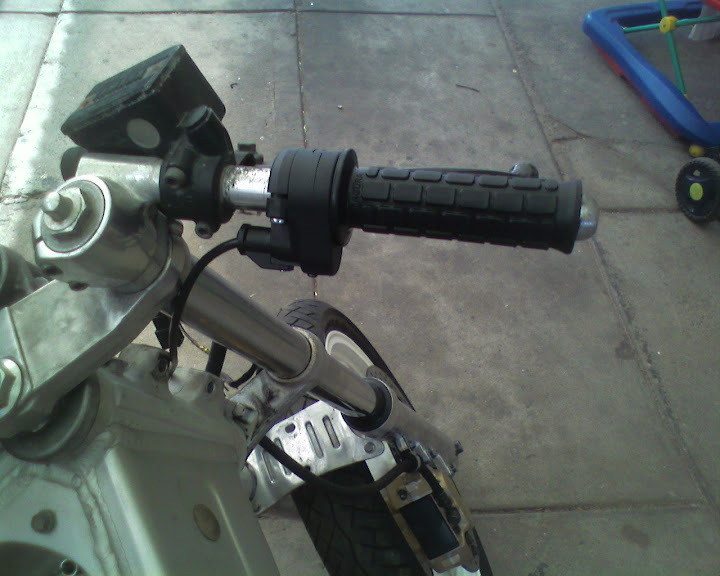 ), charger, hydrolic rear brake left hand lever assembly (with hose), gages/meters and new handel bar switches. 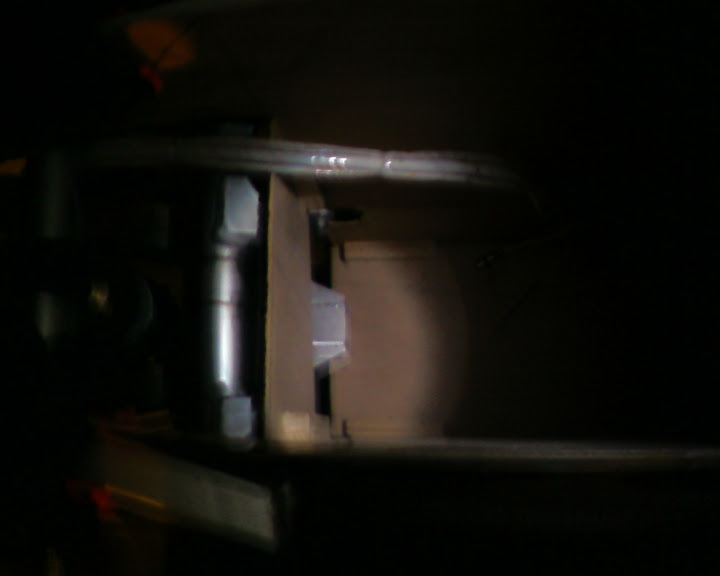 Also plenty of things to build - battery box, fairings and storage box (like on a scooter except not under the seat but in, what was, the old fuel tank), and lets not forget the wirering etc., lets hope I don't reverse the wireing anywere (as in Nevilleh's BMW). I have finished reconditioning the swing arm linkage bearings and will recondition the right front fork this weekend. Also should have a mock battery box made. Will add some pics of this when done. you don't hear about it as often with the BLDC controllers, as almost no-one has a setup that requires that much continuous power. they aren't used in cars due to the lack of availability of suitable motors. im less sure about the new black case controllers. their size would indicate the heat issue has been addressed. no data on that yet. on your bike, you are only likely to encounter this issue when needing more than 10kw for a long period of time (well, minutes). so high speed or hill climbing. already having (ordered?) the controller, if this becomes an issue, you can add a watercooled base. that both increases the thermal mass, and increases heat dissipation. I was thinking of mounting it on the aluminium battery box I am going to build. A flat plate (on its side) about 450mm X 450mm. That should help to disipate some heat. But the water cooled base sounds like a great idea if I can't find the room to mount it on the battery box. Love this forum - you get great ideas and info passed to you. Mark from Enertrak has used 7 Kelly controllers on bikes and has had no problems. Possibly because the motor is rated at 10 kw so it would get hot as well (and maybe) signal the controller to cut back before the controller gets hot ??? Just guessing. the I^2T of a motor is many times that of a controller. so the controller gets to temperature long before the motor ever does. also, Marks bikes i doubt are really able to load those kelly controllers up, to get them to overheat (t would take a long top speed run with some hill). not something you will encounter on the street, but definately something you might find at the TTXGP. Didn't do too much over easter, Just a ply wood battery box mock up. Here are some pics (It seems a lot of people are interested to see how I will get 36 X 100 Ah TS or SE LiFePo4 bats. in my frame). This pic is the central (aluminium stress member) battery box. Two levels of 3 X 3 = 18 (half way there). The pointy bit on the front at the bottom is just so there is no square leading edge (nothing in it). The ground clearance is just enough to clear a concreat curb (170mm). Do I have enough clearance between the layers of batteries ? Font supension at full compression (no springs in forks). Yes there is clearance - the box could be moved back a few more mm if desperate. A peek in side the box (3 X 68mm) wide - 204mm. Forgot to take this one during daylight hours. Another peek inside showing the mount for the steel cradle that I want to cut off. To this central battery box add another on to the outside with Two rows of 3 extending outwards (on the same level) thats another 136mm extra width (battery width is 68mm). Need to cut the stand mount off. Finding a new place to mount the side stand won't be hard. Now, a another two above the six like so, and that makes 8 this side. (With the help of my daughter). Now 8 this side plus 8 the other side is 16 + 18 = 34 (2 to go). 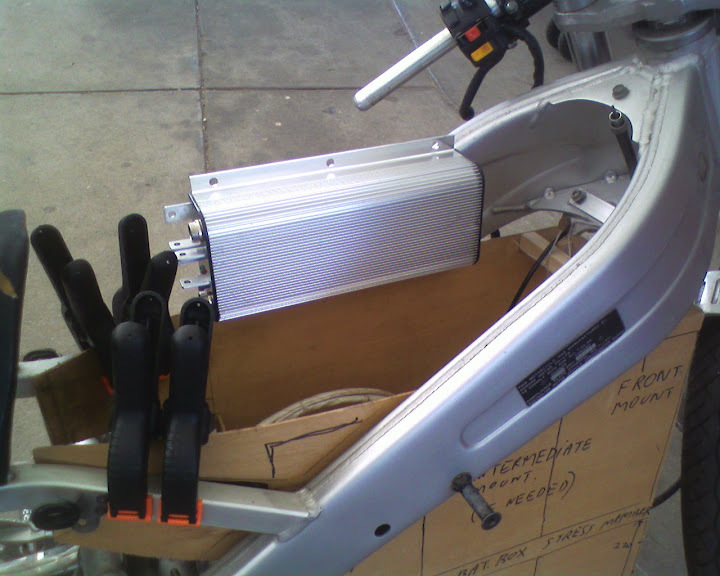 One can go where the black clamps are (easier to see on previous pic)and the other in front of the back wheel under the seat verticly. And there we have it 36 X 100 Ah TS or SE (SE are smaller so even easier). It looks like the controller will have to go on top of the battery box. Should give it a nice big heat sink. Originaly I wanted to use this space for storage - I still can but it will be smaller than I wanted now (unless I can find another place for the controller). With this configuration the battery boxes will be a total of 490mm wide (but that is less than the width measured from the ouside if my legs when on the bike). The foot peggs are even wider. This mock up will make it easier to show the enginee what I want to do and where I want to alter the frame (cut a couple of bits off). He can show me where he wants the new mounting lugs welded as well. Last edited by GRMarks on Mon, 05 Apr 2010, 16:55, edited 1 time in total. Can someone tell me if you must use the original 12V battery to run the electrics (blinkers, lights etc) and charge this with a DC-DC converter ? Can you used the DC-DC converter to run these items directly ? And should the output be 12V or 13.5V ? 3) absorb peak loads (horn, high beam, blinkers, brake lights all at once) while being charged by a smaller DC-DC. I suppose as long as the maximum load of the horn, headlights (high beam), brake lights, gadgets, etc isn't more than the maximum output of the dc-dc converter I'd not bother with an accessory battery. But it may help to have a small one just in case I guess, depending on how your pack is broken up and what you're using to do it. Last edited by Thalass on Sun, 11 Apr 2010, 18:31, edited 1 time in total. Thanks to those of you who answered my question above. My Controller, small DC-DC converter and throttle have arrived. They arrived last week. This weekend the enginee came to check over what I am doing. He is happy with my idea of the battery box and mounting point changes. 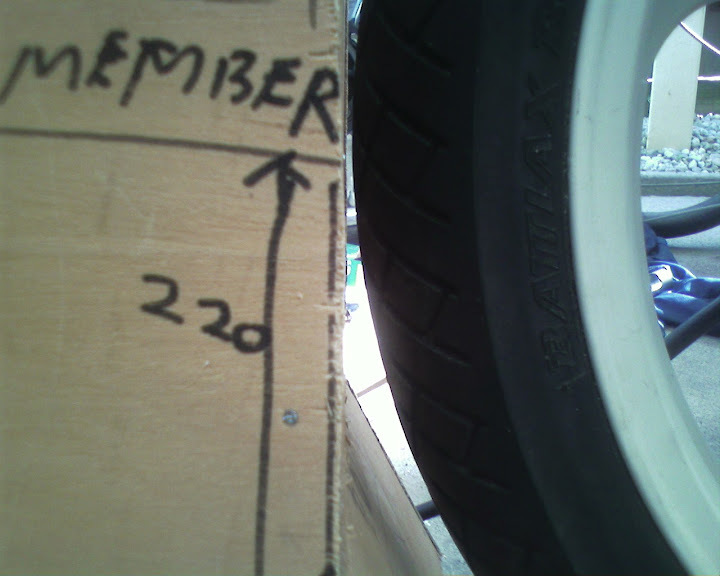 While checking over the bike he noted the compilance plate and found different numbers on it compared to the frame. He said this could be OK as maybe the bike had been in an accident and the frame may have been replaced. He had to check with vic roads for registation history of the frame number. If it had not been registered I would need to get another bike ! I had already given the old sized engine back to the wrecker so I wrang him up first thing this morning (Monday 19/04/10) to get the engine number, as this would help in tracking the bikes reistration history. Turns out that the engine number was the number on the compliance plate (not the frame number). To my relife the bike came up as having been registered via a frame number search so its all systems go now. Boy, am I relieved, I have spent money on this frame already. He still has a concern over the extera weight the batteries will add - more than 10% of original weight. Hopefully we can sort it out soon. In the mean time I have changed my plans a little, having recieved the controller. 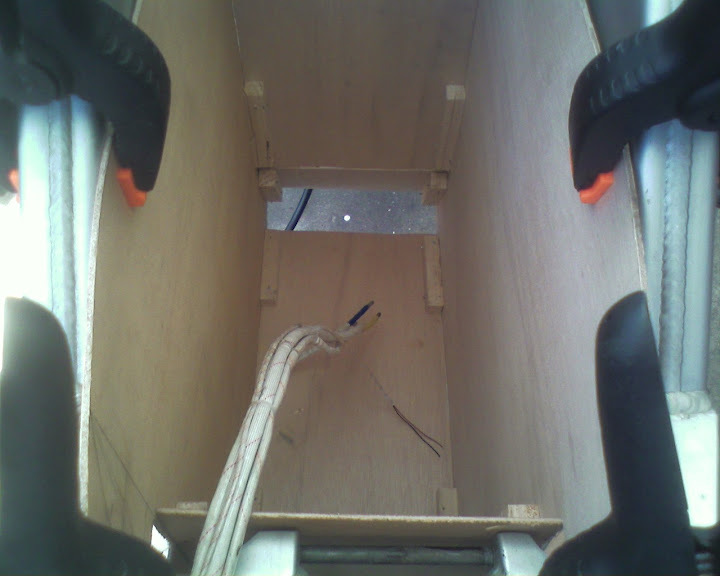 Here is some pictures of where I want to mount the controller. Here is a daylight pic of the mounting point I will be cutting off (inside the battery box) also at the top outside the battery box I will be cutting of the old engine mounts complettly (to get the weight back as far as possible). 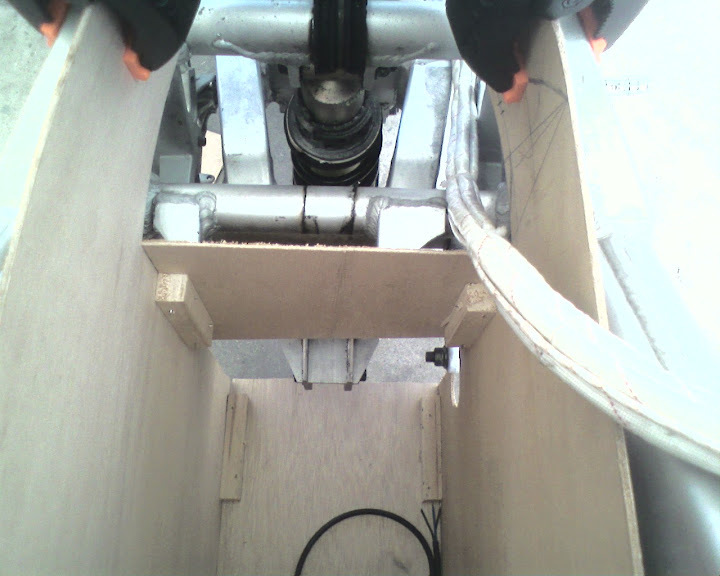 He is in total favour of this (moving the weight back) and making up new mounts for the battery box. Once the weight issue is sorted out completley I will know for sure what batteries I can use. 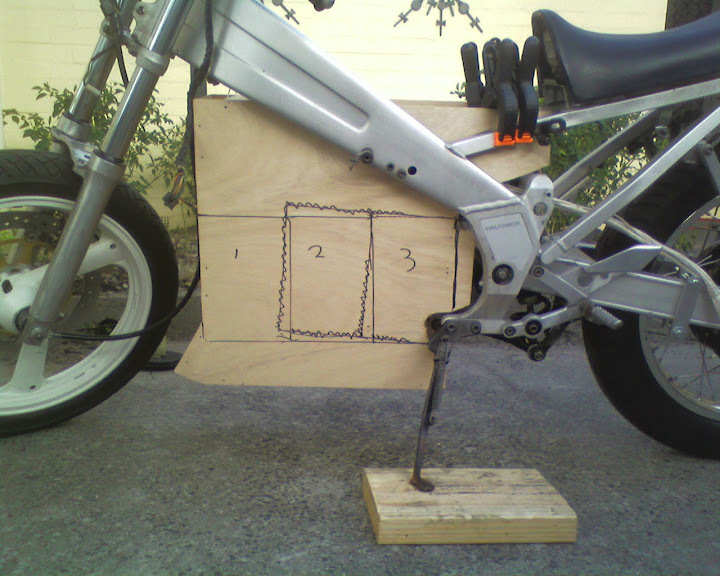 Plan "B" is to move 2 batteries from each side to back paniers but this will spoil the look of the bike. Plan "C" is to look at different batteries. 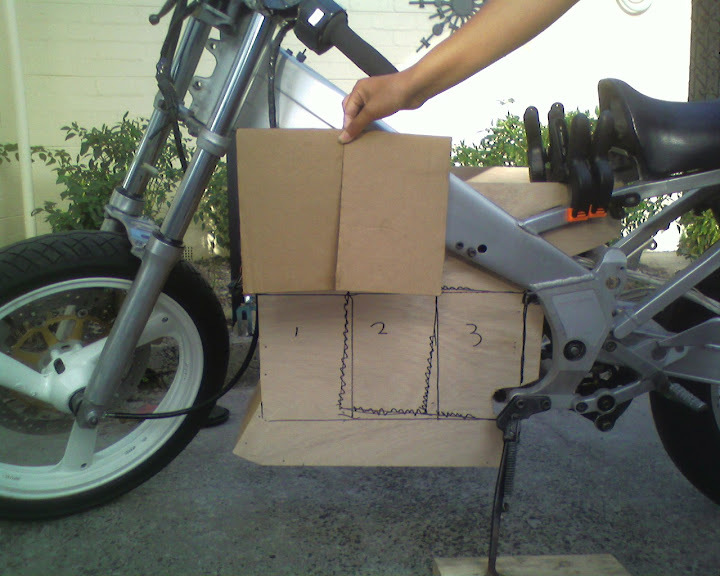 Plan "B" will give 6 batteries behind the battery box and shift weight from the front axle to the back axle. Mark can you update me on more info as it comes available on the above conversion. Last edited by GRMarks on Tue, 20 Apr 2010, 17:53, edited 1 time in total. GRMarks wrote: Mark can you update me on more info as it comes available on the above conversion. I'm trying to learn more myself. i sold this customer the wheel with disc brake option six to eight weeks ago and he sent me the photo last Sunday. But I certainly don't want to divert the subject of a TZR 250 build, so if I find out a lot more I'll start a new thread. By the way I like how you are mocking up the battery box taking the time to get it right very smart. 36 100AH cells, has to be a record amount in a motorcycle. Your range is going to be amazing. could easily be 100 miles depending on riding style. That's going to be a game changer in the EV motorcycle world. thats what I trying for - a real electric bike - one that you can do normal things on. None of this 60km range stuff (current crop of electric scooters being sold). If I have to resort to moving the batteries to back paniers then it not going to look sporty ilke the one above, but it will be practicle. I trying hard to have both. heres a thought - why don't you get picks from all your customers bikes and put them in a single thread. 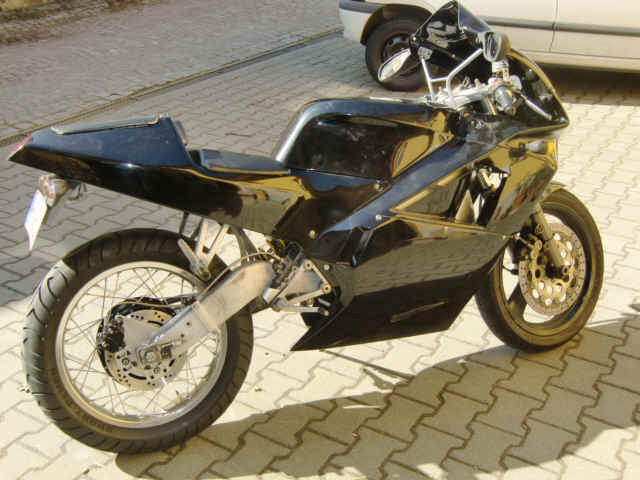 Im doing a similar conversion to my Yamaha FZR250, the dry weight of the bike seems similar to your TZR at 156kg so im should get similar results. The Frame on mine seems slightly wider too so I should be able to fit more batteries in the middle. With regards to your Battery calculations what was your final result. i am after a bike with about 50km daily commute. I do 22 both ways to work so 50km should be nice and conservative. You have seemed to flip around a bit jumping from 60Ah to 80(no idea where you would get this from to 100Ah) Due to my slightly lower requirements im thinking 60 Ah might be fine, you seemed to think 80 would get 100km so I gather by this you calculated 60Ah should get 75km? With 80% charge after 2000 cycles this gives still gives me 60km. I am wondering whether I should be going for the bigger battery pack to give me more options in the long term though. What are your thoughts? The cost is significantly more, however the range is also significantly better. Also when you imported your motor did Mark also include the brake calipers? or were these salvaged from your existing frame?